The European Space Agency (ESA) created the video using images taken by French astronaut Thomas Pesquet, a member of the Expedition 51 crew on the orbiting complex. About halfway through the video, you may notice some small, bright objects streaking through the sky. ESA officials told Space.com that these are "probably functioning satellites," though scientists were unable to confirm which satellites they were. "The giveaway is the fact that the lights are not tumbling, which indicates they are actively controlled," ESA communications officer Daniel Scuka said in an email. ESA's Space Debris Office determined that the objects are most likely not space junk, because "the objects' brightness in the video is consistent with intact objects," officials said. And they're probably not meteors, either, said Detlef Koschny, a scientist in ESA's Space Situational Awareness Program office who studies near-Earth objects. Koschny explained that a bright meteor burning up in the atmosphere typically has a duration of a second or less, possibly 2 or 3 seconds for larger objects. This movie, however, runs 25 times faster than real time, he said, meaning the objects are bright for several tens of seconds. The objects' altitude doesn't fit that of meteors, either, he added. "The typical altitude of a meteor is around 80 to 110 kilometers [50 to 68 miles]. 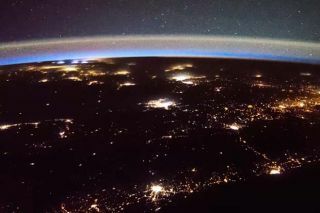 This corresponds to the height of the airglow, which is visible curving above the Earth as a brightish band," Koschny said. "These objects are higher, at least 300 km [186 miles]. Meteors would not be visible in that height." European Space Agency astronaut Thomas Pesquet takes photos through a window at the International Space Station. When lightning illuminates the sky, it is considered an indication of strong updrafts before or during a thunderstorm, according to the National Weather Service. As air swirls around in a turbulent, stormy atmosphere, the friction generates electrical charges in the clouds. As those charges build up, it leads to electrification and lightning that can be seen both from the ground and in space. Looking through the windows of the International Space Station (ISS) may seem like a convenient way to monitor storms from space, but astronauts at the orbiting lab don't spend much time storm-watching. Also, their vantage point is limited. The ISS flies roughly 250 miles (400 km) above Earth, and astronauts on board cannot see Earth's north or south poles due to the station's orbit. And because it travels at about 17,500 mph (28,000 km/h), the ISS doesn't stay over the same place for very long. Last year, however, NASA launched the most powerful lightning mapper yet; it's on the GOES-16 satellite (previously known as GOES-R), which is in geostationary orbit above the Americas. The instrument, called the Geostationary Lightning Mapper (GLM), can view lightning beneath it to a resolution of about 6.2 miles (10 km).GLM beamed back its first photo of lightning from space in March. Space.com senior producer Steve Spaleta contributed to this report. You can follow Elizabeth Howell @howellspace, or Space.com @Spacedotcom. We're also on Facebook and Google+. Original article on Space.com.